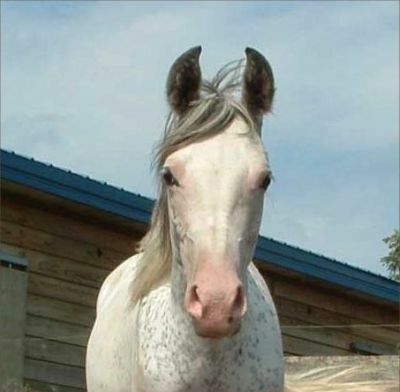 Rare dominant white mutations cause white horses with pink skin and brown eyes. The white hairs result from an absence of melanocytes in depigmented skin areas. The pigmented eyes probably occur because eye melanocytes develop in a different place to skin melanocytes. In contrast to grey horses, white horses are born white, or mostly white. In some breeds it’s thought that dominant white is associated with variable expressivity. The coat can be completely white, or partially pigmented (Haase et al, 2007). Pigmentation usually reduces or completely disappears within the first two years. 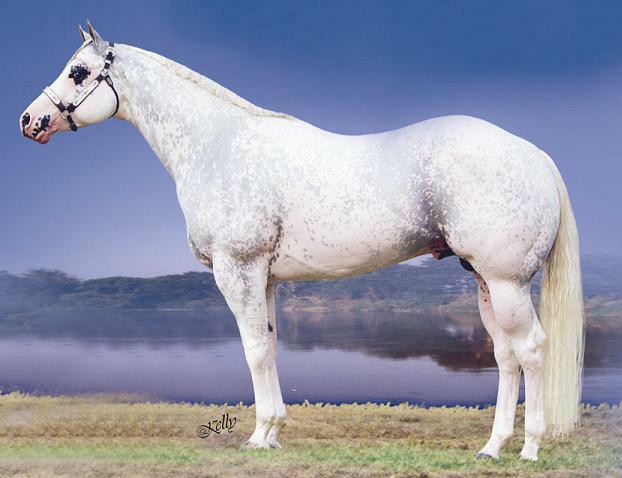 Dominant white occurs rarely in Tennessee Walking Horses, American Albinos, American Miniatures, Standardbreds, American Quarter Horses, Thoroughbreds and Arabs. It has apparently originated independently on several occasions in Thoroughbreds, and other breeds too. In White Franches-Montagnes horses are known to trace back to the white founder mare Cigale, born in 1957 (Mau et al, 2004). Camarillo White Horses trace to the white founder stallion Sultan, born in 1911 or 1912 (CWHA, 2009). White American Quarter Horses trace back recently to GQ Santana, a picture of whom can be found on this site. The first published reference to dominant white is apparently by Sturtevant (1912), who assigned the symbol “W”. Salisbury (1941) reported that it was epistatic to all other colours, while Castle (1948) suggested that it was homozygous lethal. Pulos and Hutt (1969) observed that mating between white horses produces white and coloured foals in the ratio of 2:1 instead of 3:1. It was assumed that this was due to the death of homozygous embryos or foetuses early in gestation. Mau et al (2004) suggested that the KIT gene encodes the white locus, based on the position and known functions of this gene. Haase et al (2007) sequenced the KIT gene in white and non-white Franches-Montagnes Horses. 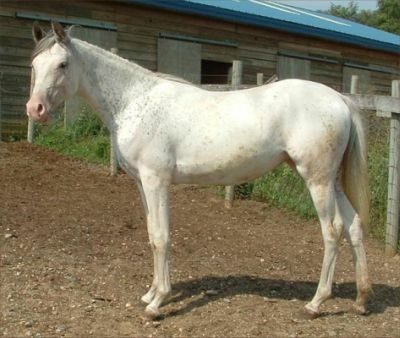 They found a mutation that inactivates the KIT gene product and leads to a lack of melanocytes in the skin of white horses. When they analyzed white horses from other breeds they found three other different KIT gene mutations in white Thoroughbreds, Arabians, and Camarillo White Horses. This shows that independent mutation events in the KIT gene are leading to white coat colour in different horse populations. It is possible that other undescribed mutations exist at the KIT locus. KIT is a complex and relatively large molecule (and the gene is long and complex with many interspersed non-coding regions called introns, allowing for the high number of observed mutations). It is important in the control of cell differentiation, proliferation, survival, and motility. It is necessary for the development and survival of melanocytes, mast cells, sperm cells, and cells of gastrointestinal tract (Roskoski, 2005). KIT mutations in other animals are associated with pigment dilution, piebaldness, anaemia, sterility, tumours and some types of leukaemia (Haase et al, 2007). A complete loss of KIT function causes death, either before or just after birth, due to anaemia (Rönnstrand, 2004). It is possible that some KIT mutations are homozygous lethal, it is now thought that this is true for some, but perhaps not all of the dominant white mutations in horses. Some current research (still in progress) is looking at the positions of KIT mutations in mice and correlating the effects with what is seen in horses. If some of the alleles in horses are homozygous lethal, one hopes there will eventually be confirmation (or otherwise), leading to tests becoming available. Interestingly roan, sabino-1 and tobiano have all been independently mapped to the KIT gene region on Chromosome 3 (Marklund et al, 1996, Mau et al, 2004, Brooks and Bailey, 2006, Brooks et al, 2007). The roan allele has been reported to be homozygous lethal in some horse breeds (Hintz and van Vleck, 1979), but thought not to be in others. Having talked to a researcher friend of mine I am of the opinion that this will turn out to be the case. The fact that there are strongly entrenched opinions among breeders on both sides, and in different parts of the World, also leads me to think that maybe both sides could be right, but neither has realised it yet. Perhaps the sequence determination of roan alleles will soon lead to a defintive answer either way. Should dominant white be considered as sabino white? Brooks, S., Lear, T., Adelson, D. and Bailey, E. 2007. A chromosome inversion near the KIT gene and the Tobiano spotting pattern in horses. Cytogenetic and Genome Research 119(3-4), 225-230. Haase, B., Brooks, SA, Tozaki, T, Burger, D., Poncet, P., Rieder, S., Hasegawa, T., Penedo, C. and Leeb, T. 2009. Seven novel KIT mutations in horses with white coat colour phenotypes. Animal Genetics. http://www3.interscience.wiley.com/journal/122386234/abstract Hintz, HF and van Vleck, LD. 1979. Lethal dominant roan in horses. J Hered 70: 145–146.